In 1986, a young retail entrepreneur, Charlie, opened a specialty sock store under the name “d.b.a SOCKS”. He learned early on that the customers wanted a greater selection of quality, fun socks and fashion-forward hosiery than he could find. Although he and his staff bought every style in every color available, it just wasn't enough to fill up the store or satisfy their customers. So, they decided to design and manufacture their own styles to fill what eventually became an eleven-store specialty chain with locations in New Orleans, Atlanta, Washington D.C., Boston, Baltimore, Los Angeles, and San Francisco. They started by focusing on design styles, materials, and construction that would create a high-quality novelty socks offering. The retail store experience put them in a unique position to understand the needs of their retail, catalog, and on-line customers, making Foot Traffic one of the first sock companies to understand the social expression opportunity for socks. They grew their novelty sock line to include more men‘s socks while expanding to cotton tights and leggings, printed tights, and “on-trend” knit hosiery. Bottom line, the new designs and styles were selling in a big way! Soon, other retailers looking for unique, quality socks, tights, and hosiery began asking if they could order from them. It was during this period that they changed their name to “Foot Traffic”. Over time, they phased out of the retail store business so that they could focus on creating and manufacturing the kind of innovative products their customers have now come to expect from Foot Traffic. Foot Traffic is celebrating its 30th year of being in the sock business and there is no stopping the team currently working on the next generation of socks for men and women. Our newest collections of legwear and sock designs are a testament to the humor and fun that our team experiences working together. But don‘t let our crazy socks fool you...we are successful because we are focused on engineering socks that not only look good but feel good. We partner with a dedicated handful of manufacturers that continue to create beautifully crafted socks made of materials that offer quality comfort and flexible fit. Today we design, manufacture, and distribute men‘s and women‘s socks and fashion legwear to upscale boutiques across the country and around the world. The FootTraffic® brand has come to represent fun, fashion forward quality and value to its many customers and clients. 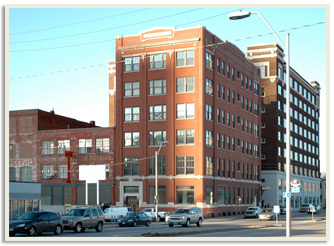 Foot Traffic is located in the Crossroads Arts District in Kansas City, Missouri in the historic Liquid Carbonic building that has been refurbished and renovated. We are a cornerstone in the district, supporting our local community, and are a natural fit within this inspiring culture of new and old businesses.